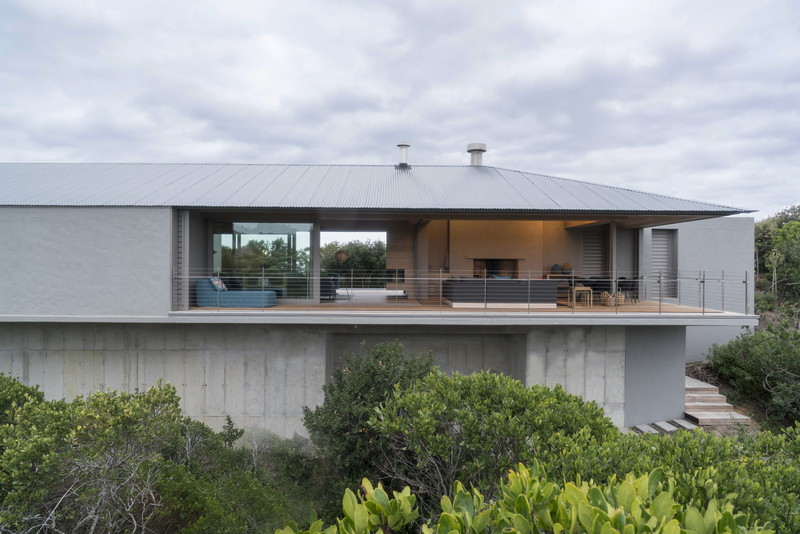 ‘Striking simplicity’ best describes the Floating Dune House, which hunkers low atop a massive coastal dune in Sedgefield. It is raised to sit above the dune to maximise views while preserving as much of the surrounding vegetation as possible. A long linear roof is bisected by a sharp, angular entrance bridge and wall. Poetic in its geometric simplicity, it sits comfortably within its surroundings and keeps a modest and restrained presence. The building demonstrates an understanding of local climatic conditions: The main terrace turns its back on the oft all-consuming sea view to scoop in the welcoming sunshine during the winter, while outside living spaces on both sides of the house were designed to account for the dominant local wind directions. Thick walls create niches within which doors and screens are stored to open to virtually the entire width of the living room in summer, and the use of the double-skin wall creates a depth that shades windows and provides privacy to the more intimate rooms of the house. What appears to be conceptualised as a linear contemporary log cabin is further reinforced through the use of the same material for floor, wall and ceiling, which has created a most satisfying cocoon-like effect with an enveloping sense of warmth and comfort. The authors have demonstrated a great mastery of their craft of architecture, right from conceptualisation through to the detailing. Whilst working with a sizeable budget they have managed to exercise restraint, which allowed the building to retain its strong conceptual base with remarkable clarity.